Young adult author Natalie Richards meets with area teens Thursday afternoon as part of a writing workshop discussing the profession of writing, how to go about being published and developing plots. 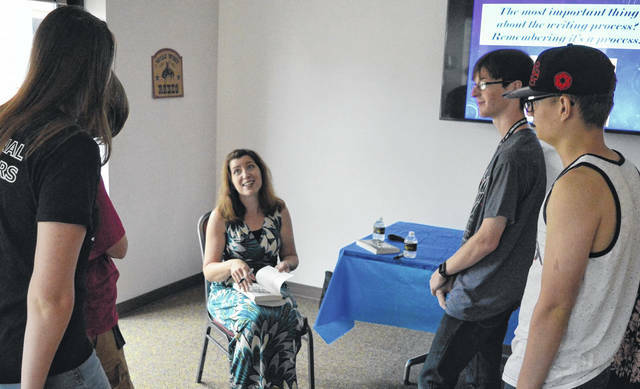 GALLIPOLIS — Young adult literature author Natalie Richards, author of critically-acclaimed novels such as Six Months Later, We All Fall Down and One Was Lost, met with Bossard Memorial Library’s Teen Summer Club to discuss the writing profession Thursday afternoon. She also met with the French City Writers’ Guild in the evening to meet with area writers and discuss the craft. Richards is the author of six separate books and the last comes out in December. Richards encouraged young writers to read outside of their standard genres of choice in order to expand their minds and broaden and better their writing by looking at new techniques. She told prospective writers to expect to write drafts over and over again as part of the process as agents and editors go over their work. She also encouraged them to not give up and to heed criticism but not negativity. Richards encouraged teens who enjoy “world-building” to look into genres such as science fiction, fantasy and history due to the nature of studying the expansiveness of cultures and environmental situations.